If we subtract total demand from supply, we get an estimated net 133 million oz (1,055 million oz supply minus 922 million oz demand = 133 million oz). GFMS classifies this surplus as IMPLIED NET INVESTMENT. 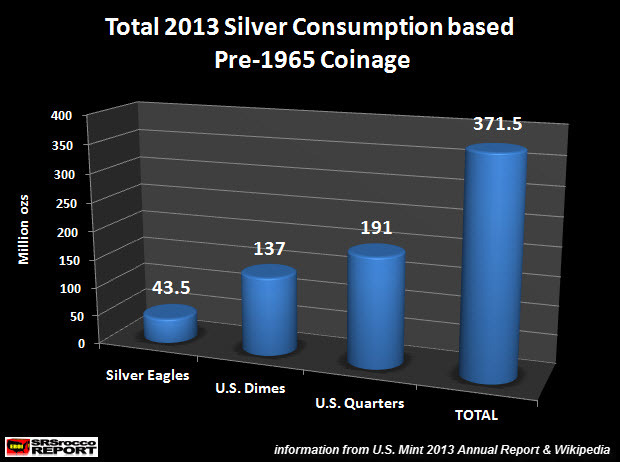 Now, if we take the total amount of silver consumed minting dimes and quarters in 2013 (based on Pre-1965 coinage), it would equal 328 million oz. We must remember, the American Silver Eagle sales are included in the Official Coin category by GFMS, so we must exclude it from the estimated 133 million oz silver surplus. So, if the U.S. Mint still produced 90% silver dimes and quarters, it would need to acquire an additional 195 million oz from above-ground silver stocks... AND THIS IS ONLY ONE COUNTRY! Not only would the U.S. Mint need to access more silver to mint its dimes and quarters, there would be no silver available for INVESTMENT PURPOSES. Which is the very reason gold and silver paper prices are heavily manipulated. As I stated above, it cost the U.S. Mint $172 million to produce base metal slug Dimes and Quarters in 2013. If these coins contained 90% silver, the cost would be a staggering $7.8 billion or 46 times the value. Even though the world forgot the value of real money... they will soon be reacquainted.